Everyone loves getting flowers delivered, no matter what time of year it is. 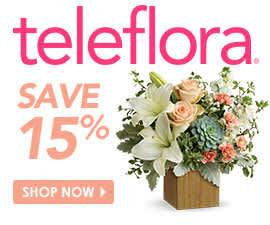 During the Christmas season, Teleflora has a wide variety of Christmas flower arrangements, complete with seasonal flowers such as red poinsettias, Christmas keepsakes like the Thomas Kinkade’s Jolly Santa Bouquet, and even flower bouquets with candles like Teleflora’s Sparkling Star Centerpiece. No matter what your loved one enjoys, there’s sure to be a bouquet perfect for him or her. If you know a loved one has a grueling job, consider having the bouquet delivered to work instead of home. Just because you can’t see your loved one for the holidays doesn’t mean you can’t send a little bit of Christmas cheer! What encompasses the holiday season more than some delectable baked goods from someone you love? If you typically decorate Christmas cookies with your child and he or she can’t come home for the holidays, consider baking up a batch and mailing them to his or her home. You can decorate them yourself, or even send a jar of frosting and some sprinkles along with the cookies! If this is your first Christmas apart, you can Skype or FaceTime while decorating cookies together! This is also a good idea if you have a specific dessert that you only make around the holidays. Sending a pumpkin pie or a batch of cinnamon rolls to a homesick child is guaranteed to stir up some nostalgia. It’s not just family matters that people miss around the holidays, it’s their hometown and state as well. Let your loved one know that the area misses him or her just as much by sending a themed basket for the holidays. If there are any specific spots in your hometown your loved one misses, try to send a little piece of home for the holidays in the basket. Think of other themes your loved one would appreciate, like a movie night or craft supplies. No matter how old you get, you’ll never be too old for an classic care kit. Send your loved one everything he or she would need to get through the winter. This could include a cozy blanket, some hot chocolate packets and fuzzy socks. This could even include paper products, razors and nonperishable food items. The holidays are the perfect time to reconnect with old friends and loved ones, near and far. Just a small hello is the only gift someone really needs to feel special, but it never hurts to be a little more personal!